Kremlin Administration employees and, personally, President Vladimir Putin are surprised and disappointed by the content of two requests for interview filed by two esteemed Western media outlets, those of the UK and the U.S. The Kremlin intends to say "no" to all their questions but one, but will not take legal action or hold any inquiries. Kremlin press secretary Dmitry Peskov has told reporters about the essence of the requests "which were absolutely identical by their terminology and phrasing." "These requests are a rather eloquent confirmation as to how uncomfortable Putin remains to those who are lacking a constructive attitude to our country and their ongoing purposeful, quite rude information attacks, devoid of elegant creativity, on the Russian president," the press secretary said. In the words of Peskov, "the requests invited Putin to answer questions and to comment on accusations in his own words." According to the requests, their questions are based on "accusations and speculations about Putin and a number of people from his entourage in the context of U.S. sanctions," he continued. The media outlets underlined that the answers of the Russian president might be used as a supplement to the pending articles. "I have been a liaison with the media for a long time. But I have never seen a notice saying that unless the answers are received by a certain date they will presume that he does not want to comment on either issue. Moreover, the media outlet warned that it would not take for substantive answers any general statements regarding any inaccuracies and so on and so forth," Peskov said, expressing his bewilderment at "such categorical wordings." The presidential press secretary gave examples of several questions asked in what he called "the style of questioning by a prosecutor": "The United States alleges that the activity of Mr. Timchenko in the energy sector is directly or indirectly related to Mr. Putin. Is this correct? ", "Has Mr. Putin invested money in Gunvor Group either directly or indirectly? ", "Did Timchenko give financial support to Mr. Putin after Putin had moved to Moscow in 1998? ", "Did Putin and Timchenko discuss business and private matters in the 1990s? And if they did, then how often did that happen? ", "Is it true that Putin, during his work for the St. Petersburg administration, approved a 23 billion-ruble loan to the development corporation 20th Trust?" 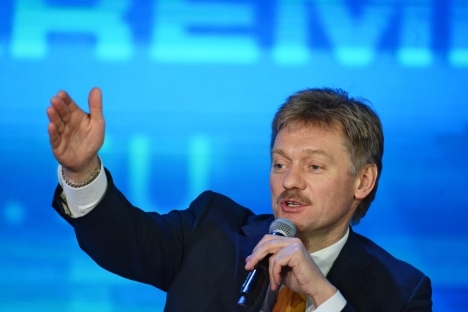 Peskov said that the British media outlet's request contained 21 questions in all. "I was jarred by their categorical tone and interrogation-type style. So, I wanted to share this," he said. According to the presidential press secretary, the request sent by the U.S. media outlet was "a total phrasing clone" of the British request. "Despite the criminalistic and prosecutorial style of these requests, we of the Presidential Administration do not hold investigations," Peskov said. "We are constantly encountering attempts to nip and bite us, and we are always patiently giving our answers and explanations. But, to be frank, we have never encountered such things before," he said. The presidential press secretary made it clear that the requests would not be answered. "We have explanations to only one issue, but as the media outlet wrote that it would not accept a general answer, I would not quite be comfortable writing 'no' in the answer to every question," he said. As to how the president had reacted to the requests, Peskov said that Putin "was rather surprised by the abundance of slander they are trying to cook. Moreover, at such esteemed media outlets, it is a bit surprising." "We highly value professionalism and lack of bias in the leading Western editions and, naturally, we are very disappointed whenever some of them lower themselves to such things," Peskov said. The Kremlin is not going to look into reasons for the filing of near-identical requests. "We are not investigators, and this is not a case that needs investigating, everything is so obvious," the presidential press secretary said. At the same time, he assured reporters that the move could not impact the readiness for dialogue with the West. "No doubt, it cannot have any impact. We have said time and again that Russia is absolutely open to dialogue, to discussion of the most complex and unsolvable questions," he said.